So this is my first post. March 24 at 11am under a Taurus Moon – and this is where I am going to store all our vegetarian and vegan recipes. The reason this quote works for me and the ethos of this blog is that the idea with so many of these recipes is not to master them and just use them one way – as per the recipes – but rather to use them as a base for lots of other ways of making things. I am not sure if that is very well explained so let me try another way. My glorious hubby Olivier is French and he loves to cook. Some of his specialities include – for example – coq au vin and poulet au vinaigre. There is really only one way to cook these (unless you’re on Masterchef, say, and you decide to try and reinvent or deconstruct them). But with the recipes on this blog (which may I say my hubby is also a master at making!) you can tweak things, take one component from one recipe and add it to another, add some extra herbs and spices or take them out, mix and match and get to the point that, as long as you have SOME veg in the fridge, you’re never stuck for something yummy to whip up. We never need worry about going hungry or being reduced to ordering take away again! One cup of whole grains of your choice, cooked according to the package instructions. Cook 1 cup of whole grains in 2 1/2 cups of water or broth along with a pinch of salt. While the grains are cooking, prepare the greens by slicing them thinly and placing them in a medium bowl. Toss with the apple cider vinegar or lemon juice and sprinkle with a pinch of the sea salt. Set the greens aside to tenderize. Season the sweet potato with salt, pepper and a dash of cumin, if desired. Roast the sweet potato in a tablespoon of coconut oil or olive oil in a 425 degree oven until tender. When the grains are very nearly done, add the edamame to the cooking pot and cover. Remove from the heat. Toast the nuts and seeds (if using) in a dry frying pan for just a few moments until fragrant. Whisk the ingredients for the dressing in a small bowl. The dressing should be smooth and a little runnier than honey. Assemble the bowls starting with a serving of the grains and edamame. 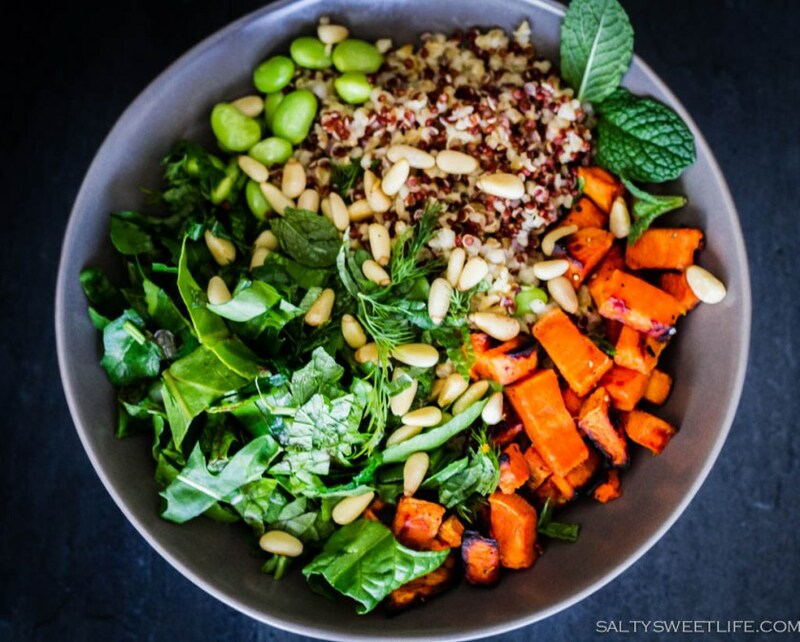 Top with the greens, the sweet potato and the nuts and seeds. Finish with a small handful of the tender herbs. Drizzle the dressing over the top and enjoy!